Back in 2008 I worked with my good friends James Flexner and Jesse Stephens on Moloka’i, the 5th largest island in the Hawaiian archipelago. 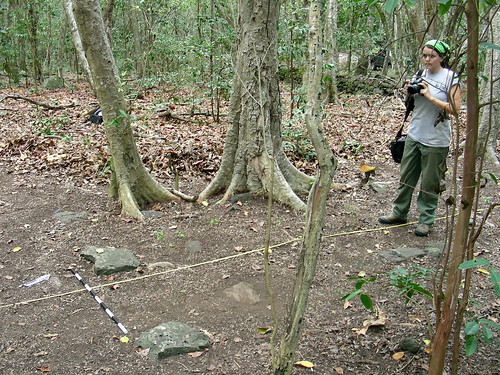 We recorded surface middens and opened up very small excavation test pits in the leprosarium on Kalaupapa, a peninsula on the north side of the island. 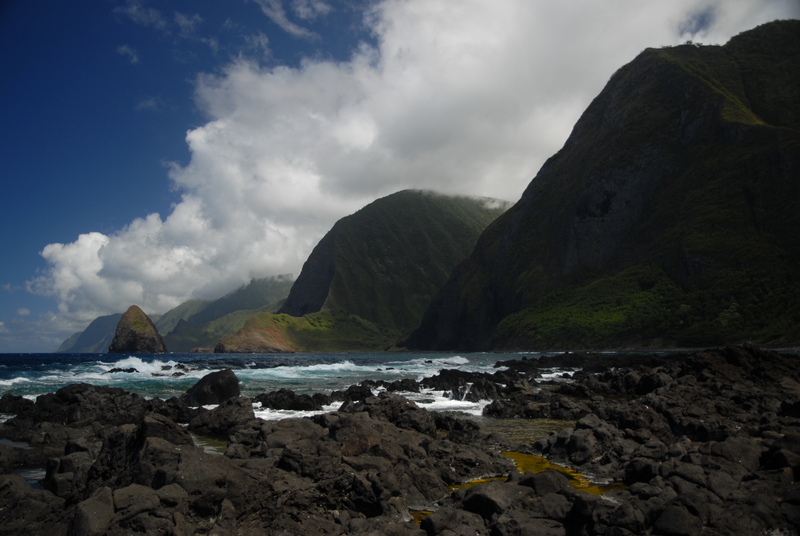 Kalaupapa is very isolated–it is cut off from the rest of the island by the highest sea cliffs in the world and rough seas on three sides. 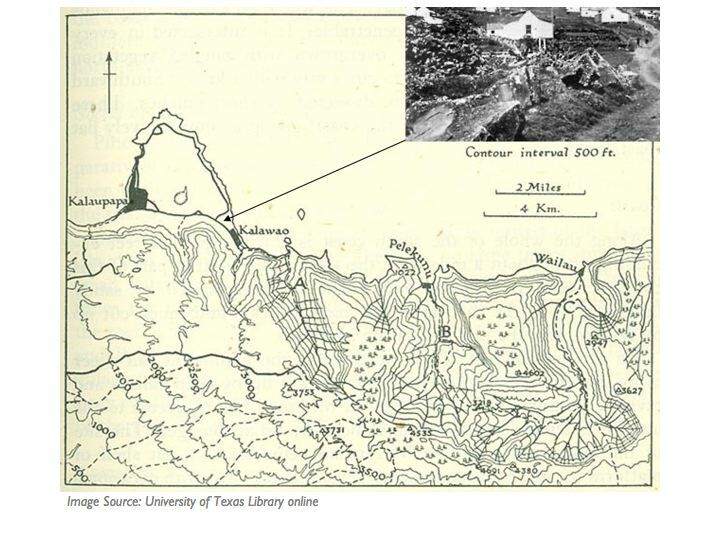 The settlement is equally fascinating and tragic; people suffering from Hansen’s disease (leprosy) were quarantined in Kalaupapa and Kalawao from 1865 to 1969 and they constantly struggled to obtain sufficient food, clean drinking water, clothing, and shelter–add this to being isolated from their families and former communities and the health problems that arise from Hansen’s disease such as losing sensation in your extremities. Another interesting aspect of the island is the eventual presence of Father Damien. He served as a Roman Catholic missionary, ministering to the inhabitants and eventually built St. Philomena Church. When we visited the church, James pointed out the holes in the floor next to the pews where parishioners could relieve themselves of one of the afflictions of the disease–excess saliva–without disrespecting the church by spitting on the floor. There is also one next to the altar. Father Damien eventually caught leprosy too. Father Damien has recently been canonized, and the potential for tourism in Kalaupapa National Historical Park is high, but will not be fully realized until the last of the residents of the leprosarium has died. When we were there, access to the park was very restricted, and we had the densely forested uplands and gorgeous beaches to ourselves. This is me documenting the flat rocks where a house built on posts formerly stood. While I was working there on James’ project, we collected and documented the historical assemblage–rusty bits of metal, ceramics, broken glass, and animal bones. I started to notice something strange about the glass though–some of the edges appeared to have usewear on them. Usewear is the damage that archaeologists can identify on a sharp edge of stone tools. I was cautious though–depositional processes can play havoc with glass. I had just finished an analysis on Ishi’s glass points and debitage in the Hearst Museum (click here for a bit more information on that tragically unpublished paper) and was attuned to worked glass. Essentially, it appeared that given the dearth of resources available to the residents of the leprosarium, and that metal rusts at an extremely rapid pace, glass was used both expediently (you find a shard, you use it to cut something) and was worked–we found what appeared to be a clear glass blade formed from a flake. Given that people suffering from Hansen’s disease lose fine motor control, it is an especially interesting technical innovation. We found a few instances where the necks and bases of bottles were preferentially selected to provide large surfaces to grab on to. Finally, this innovation is especially interesting in that the communities on Hawaii do not have a history of making blades from stone–The obsidian that occurs there is very small and nodular and is usually worked into 1-2cm sized flakes from bipolar reduction. Flaked (or chipped, if you are British) glass is seen as a quintessential “contact” artifact, showing the use of introduced materials into cultural practices that were based around obsidian or flint. 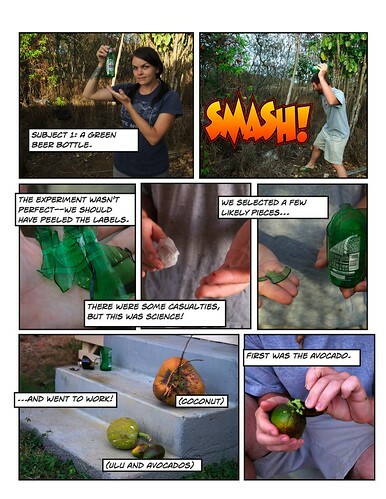 Flexner, J. L., and C. L. Morgan (2013) The Industrious Exiles: An Analysis of Flaked Glass Tools from the Leprosarium at Kalawao, Moloka‘i. In The Archaeology of Hybrid Material Culture, edited by J. J. Card. Center for Archaeological Investigations, Carbondale, pp. 295-317.